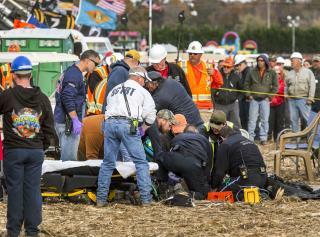 (Newser) – Delaware's famous Punkin Chunkin competition, in which teams fire pumpkins impressive distances from an assortment of contraptions, was hit by tragedy Sunday when a pumpkin cannon blew up, critically injuring a 39-year-old woman. The "Pumpkin Reaper" air cannon was getting ready to launch a pumpkin when the trapdoor and other parts of the cannon were blown into the air before hitting the woman and a 56-year-old man whose injuries were not as serious, WMDT reports. The event, first held in 1986, was returning this year after a two-year hiatus that followed a 2013 incident in which a volunteer was injured in an ATV accident and filed a lawsuit. Its all fun and games till someone loses a thigh. Pumpkins lives matter. Compressed gases demand respect... if you ignore the danger, sooner or later it'll bite you.